The Allies had procrastinated too long. The fact remained that the Germans were using high ground in vicinity of the 1,400 year-old Benedictine Abbey on Montecassino as artillery observation posts. Because of them, American men died daily. "If we have to choose between destroying a famous building and sacrificing our own men, then our men's lives count infinitely more, and the buildings must go," decreed General Eisenhower. 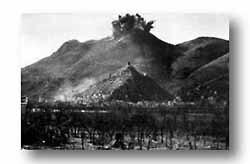 The first of the heavy bombs brought by the Flying Fortresses strikes the abbey on Montecassino Hill. In mid-February 226 Fortresses, Liberators, Mitchells, the Marauders flew over the snow-capped mountains, and with terrifying precision dropped their bombs on the monastery. From neighboring Castellone Ridge men of the 36th watched excitedly as the great billows of smoke and flame consumed the abbey. By the next day only one small section remained standing. But even after the bombing, Allied offensive attacks fared no better. Soldiers of varied race and uniform fought side by side in the Cassino sector. 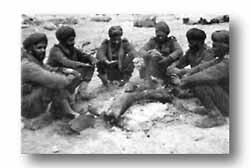 Men of an Indian Punjab regiment (left) semi-circle around their fire. Several of the punjabi have removed their shoes and are warming their feet as a precaution against trench foot. 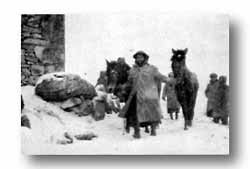 On the right French Guoms (North Africans) bring their mules down the trail in a blinding snow storm. Turban and blanket-garbed Guoms  their costumes looked like bathrobes  were feared most by the Germans because of their dexterity with knives. On patrol action they frequently brought back warm German ears.